Overberg Asset Management specialises in the management of private share portfolios. In the immensely competitive asset management industry the Overberg philosophy ensures a secure long-term relationship with our valued clients, built on trust, service, value and performance. Stay up to date with our in-depth weekly market analysis. We produce a weekly report of local and global market news, an up to date technical analysis and a summary of what it all means to our Investors. Read our most current weekly report or view our archive dating back to 2011. 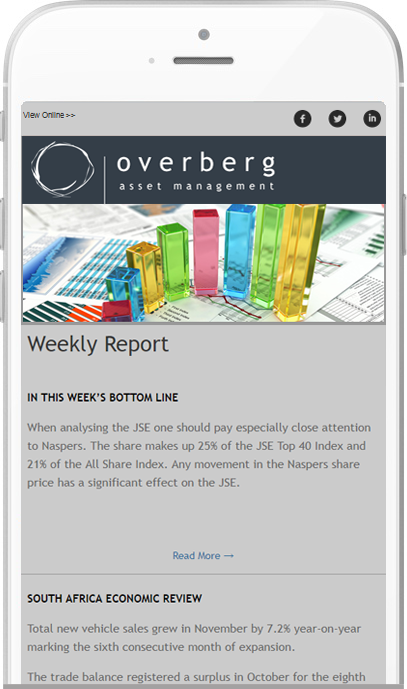 Join our growing list of subscribers and receive our weekly report in your inbox. We have developed strong working relationships with specialists in South African retirement products, UK based pension plans and ISA products, estate planning and trust structuring, foreign exchange and money market services.